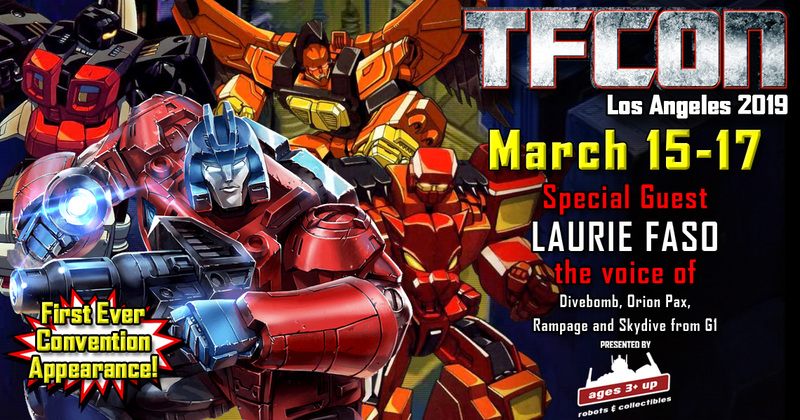 TFcon is very happy to announce Laurie Faso the voices of Divebomb, Orion Pax, Rampage and Skydive in Transformers Generation 1 will be joining the G1 Reunion event happening at TFcon Los Angeles 2019 for his first ever convention appearance. He is also known for his roles as Raphael in Teenage Mutant Ninja Turtles II: The Secret of the Ooze and Tunnel Rat in G.I. Joe. Laurie will be taking part in autograph sessions with the attendees of America’s largest fan-run Transformers convention on both Saturday and Sunday of the convention. Please check the TFcon website for the full guest signing schedule prior to the event for exact times. Laurie Faso is presented by Ages Three and Up.